[miau] The Desert Treasure Slot machine game has a beautifully colored scene of the Desert with the yellow gold sand, the orange reflection of the sun and the green palm trees. All of this represents the Arabian Nights Theme. There are lots of fun sound effects and colors to keep it fun. The game shows you pictures of princesses from a harem, which is the scatter symbol, and the red King Cobra snakes, which are wild symbols. You will also see camels, pictures of an oasis, the number 10 in gold, a map, compasses, scorpions, and beetles as the game spins. When you spin and get two or more of the princess symbols, you can win twice, five times, fifty times or even five hundred times your bet. This depends on how many of the princess pictures you got. If you get three or more of the princess symbols, you will win 10 free spins that can be tripled. When the princess appears, it also sets off a bonus round. When you spin and get three or more compass symbols that are in a line from left to right, you go to a bonus screen and are able to pick one or more prizes depending on how many compasses appeared when you were spinning. All wins are tripled during a free win except for a bonus win. You can win more free spins during a free spin. You can then become a desert trader and you get to pick a prize. When you win, the game plays music to symbolize a win. There is also a golden cobra that appears once in a while that is a wild symbol-similar to a wild card. Certain pictures set off different sounds when they become winning combinations. You are able to play the game in real time for coins which become real money or you have the option to play for free. The only difference when playing free is that you do not actually win prizes. When you are playing with money, the game starts out giving you a $3000 bonus to play with. You can start out playing with a bet as low as a penny, or as high as $200. There are five columns spinning with 20 potential patterns which can become 35 combinations to win. You can also win by wild cards, scatters, winning free spins, or you can dig for treasure when winning a bonus game. I decided to try the game and decided to play for free. I won the 3rd time I spun and got to pick four prizes. I ended up winning $209, which made it fun right off the bat. I was impressed by the fun of the game and will be coming back to play for real money and real fun. 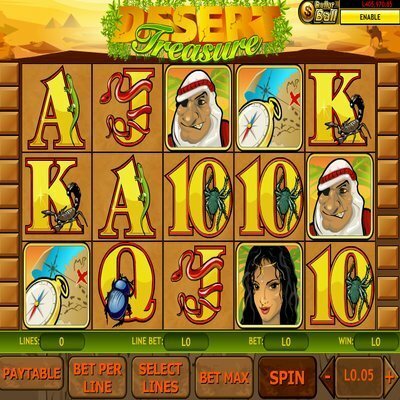 There is also a Desert Treasure II slot machine game. There is a mobile version of the slot machine game Desert Treasure, for the Android, Windows, Blackberry, iPhone, and the iPad. You can only bet up to $5 and it has one coin per line, but does include the bonus game with the app. To start the bonus game, you must get three or more compasses on a line and three or more Princesses will get you ten free spins. The cobra wild symbol will take the place of most symbols at one time or another. The Arab, the camel, and the oasis are regular symbols on the mobil app.